A large oblong classic apple strudel encased in a wonderfully flaky pastry jacket. 600g of deliciousness, enough to feed the whole family and guests. Deep frozen. No artificial colours, flavours or preservatives. Vegetarian. 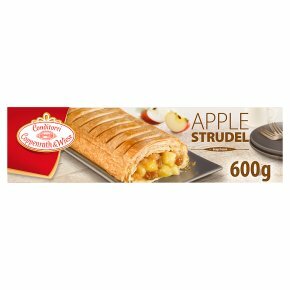 Remove Strudel from the packaging. Cook from frozen. Do not defrost in microwave! Some ovens bake more quickly than others - please adhere to the instructions relating to your oven.Pre-heat oven.Place the Strudel on a baking paper lined baking tray on middle shelf in the oven.Oven 200 °C, Fan assisted oven 200 °C, 35-40 min.